My mother has a weight driven grandfather clock made by an "A.W. Miller". 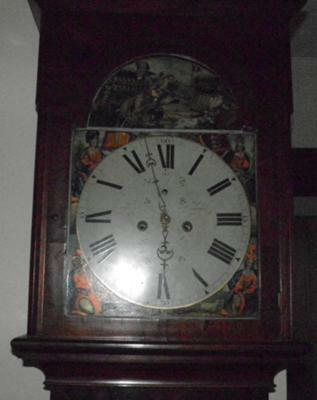 I can not find any information about this clock or its manufacturer. There is nothing inside the clock case to indicate where, when, or by whom it was made. Just "A.W. Miller" and "Airdrie" on the face. Images of the Queens of England, Scotland, Ireland and Wales surround the face. Above is a depiction of the Battle of Waterloo with the Duke of Wellington on a horse. When the pendulum swings, the horse moves back and forth. Made of a dark red wood. Any information about this clock would be greatly appreciated.